James Miller's Can Democracy Work? is a coming-of-age story for a generation of Americans whose ideals of social, economic, and political progress foundered on the rocks of brute capitalist power. 'Can democracy work?' is a question whose answer in the affirmative seems less and less certain these days. On one hand is the rise of authoritarianism. In a recent segment of his HBO show Last Week Tonight, John Oliver expressed concern over the trend, citing the obvious, Vladimir Putin of Russia and Chinese President-for-Life Xi Jinping, but also Hungary's Viktor Orban, Recep Tayyip Erdoğan of Turkey, and far-right politician Jair Balsanaro, the new President of Brazil. On another, and equally disconcerting to Oliver, is the fact that many of these authoritarian regimes have ironically gained power by being duly elected by their constituents. The United States is not in a league with the aforementioned examples, although it's not for lack of trying by the current incumbent executive, AKA 'Individual 1', and his cronies. 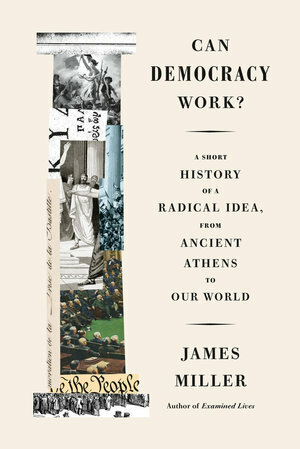 Taking up the question literally is historian of ideas and Professor of Politics at the New School for Social Research James Miller, whose latest book endeavors, as its subtitle suggests, to give a history of democracy from ancient to modern times. The idea of democracy has its origins some 500 years before the common era in the Greek city-state of Athens. Indeed, the terms we use for democratic politics come to us from the ancient Greeks, from dēmokratía, rule by the people, and politiká, affairs of the city. Every citizen was expected to directly participate in the political life of Athens; they were not elected but chosen by lottery, providing equal opportunity for all to serve. Assemblies of citizens, which took place at least 40 times a year, were open to all and ordinary citizens held public office and served on juries. And yet, even then democracy was a contested idea. Perhaps most famous was the critique of Plato who, in the Republic, held that democracy necessarily degenerates into tyranny due to the susceptibility of public opinion to false beliefs, exemplified in the Allegory of the Cave, where shadows cast by a fire on the wall are mistaken for reality. The model of good government was instead aristocracy, led by a philosopher-king who ruled with reason and wisdom, guided by knowledge of the Ideal Forms. Plato was joined by his near contemporary, the classical historian Thucydides, who blamed the defeat of Athens at the hands of Sparta in the Peloponnesian War (431-404 BCE) on the manipulation of the citizens by demagogues (from the Greek dēmagōgos, leader of the people) who persuaded them to blindly march down the road to perdition. Moreover, the definition of citizenship in the Athenian polis (city) was restricted to adult males who had completed military training; slaves, including those who had been freed, women, and foreign residents were excluded. Citizens could also be disenfranchised as a penalty for certain crimes and failure to pay debts to the state. And not unlike the United States today, the elite sought over time to restrict citizenship further, in the case of Ancient Greece to only those descended from citizens on both sides. According to John Thorley's Athenian Democracy (Routledge, 2004), at best the category of citizens accounted for no more than 30 percent of the total population. For the next two millennia, the notion of self-rule as exemplified by the Athenian democracy lay dormant, generally considered inferior to either monarchy or aristocracy. The Renaissance saw the embrace of the republican model, first described by the ancient historian of the rise of Rome, Polybius (c. 200-188 BCE), as a system of checks and balances that merged monarchy, aristocracy, and democracy, with the last constituting an unstable element that while useful in guarding against the abuses of the first two was liable, much as Plato and Thucydides feared, to devolve into mob rule. It wasn't until the mid-18th century that democracy as a form of political governance began to be re-embraced and developed into that which we recognize today. Contrary to the adherents of American exceptionalism, Miller picks up democracy's story not with the United States in 1776 but with the French Revolution (1789-1799). A key figure here is the 'dreamer of democracy', as Miller once characterized him in a book of that title, the Swiss philosopher Jean-Jacques Rousseau, particularly as he retooled the concept of sovereignty from the divine right of monarchs to the 'General Will' of a people. Another important figure of the period is the political theorist and mathematician, the Marquis de Condorcet, who drafted the first modern democratic constitution, which was never implemented as he was forced into hiding in the wake of the Jacobin uprising that culminated in the Reign of Terror. (Condorcet was arrested as he attempted to flee Paris, imprisoned, and died under circumstances that continue to be the subject of speculation.) And of course, there's Maximilien de Robespierre who, as a member of the Committee of Public Safety, argued for the execution of King Louis XVI, as well as a speedy and abundant use of the guillotine as a tool for purifying the body politic and to which he himself ultimately fell victim. A reading of The Federalist Papers reveals the deep skepticism with which the American Founding Fathers held the notion of pure democracy, advocating instead for a system of checks and balances along the lines conceived by Polybius. The three branches of government effectively mirror Polybius's republic with the executive mirroring the monarchy, the judiciary the aristocracy, and the legislative the democracy. Even in the last instance, however, the bicameral structure of the legislative branch additionally checks the democratic impulse with the Senate, reinscribing a measure of aristocratic restraint over the potential unruliness of the House of Representatives. The Electoral College further foils majority rule. The exception was Thomas Paine, who in the 1776 pamphlet Common Sense argued for a unicameral legislature subject to robust citizen oversight via a broad definition of the franchise and frequent elections, a rash suggestion quickly refuted by future President John Adams in his riposte Thoughts on Government. Even so, throughout the 19th century, the idea of democracy continued to expand in the United States and elsewhere in the West. Thomas Jefferson arguably introduced the term democracy, if not entirely the fact of it, into the American political lexicon under the auspices of the Democratic-Republican Party, which defeated the Federalists in the presidential election of 1800. Jefferson's political ideal was hardly that of Rousseau, Condorcet, and Robespierre, though, with its commitment more to the republican side of his party's name than the democratic. The democratic aspiration expanded with the rise of Andrew Jackson to the Presidency in 1828 in the wake of the factionalizing of the Democratic-Republicans, along with the expansion of the franchise to a majority of adult white males, as opposed to being restricted only to property holders. Ironically, Jacksonian democracy at the same time promoted a strong executive at the expense of the legislative branch and to a lesser extent the judiciary, a case of the populist demagoguery critics of pure democracy have so often decried. Other instances of attempts at proliferation of democratic reform over the 19th century include Chartism in Britain, the working-class movement that sought expansion of the franchise to all males over the age of 21 and other egalitarian initiatives, and the Paris Commune of 1871, the short-lived radical government that ruled the city in the wake of France's defeat in the Franco-Prussian War. As Miller notes, both failed to achieve their immediate goals, but particularly on the left they became models of pure democratic societies to come and in fact foreshadowed reforms that expanded suffrage and solidified the modern political parties under which most forms of national self-governance continue to operate. A major issue Miller seeks to address is democracy's ostensible relationship to liberalism, which has its origins in the Age of Enlightenment. Against tyranny and superstition (which is to say, monarchy and the Church), the thinkers of the Enlightenment sought to place equality and reason at the center of human affairs. In particular, the so-called Father of Liberalism, the British philosopher John Locke, held that each man (sic) has a natural right to life, liberty, and property, the last notion of which Jefferson elided into the pursuit of happiness. As a political and moral philosophy, liberalism advocates the freedom of individuals to self-determination. From this, Locke developed the radical idea that government is a social contract that requires the consent of the governed in order to be legitimate. In practice, liberal democracy has proven to be a fraught concept. In the penultimate chapter of Can Democracy Work?, Miller cites 28th President of the United States Woodrow Wilson, American journalist and political commentator Walter Lippman, and Austrian economist Joseph Schumpeter as acknowledging democratic 'sovereignty' as more a matter of consent than participation. Even the notion of consent has increasingly diminished as dramatically rising inequality and economic wealth concentration, along with the political influence it buys, threatens the very foundation upon which the modern democratic project has been erected. Taking a cue from the examples of the Chartists and the Paris Commune, whose egalitarian aspirations failed in the short term but heralded the expansion of democratic practice over the long run, Miller ends both Can Democracy Work? and Democracy Is in the Streets on a more positive note, acknowledging the propensity of the idea of democracy to persist against all odds. It's an example of the motto often attributed to Italian Marxist and legendary jailbird Antonio Gramsci, to wit: 'I'm a pessimist because of intelligence, but an optimist because of will.' In these seemingly dark times, that works well enough for me.